Build your own mission double dresser with this paper plan! 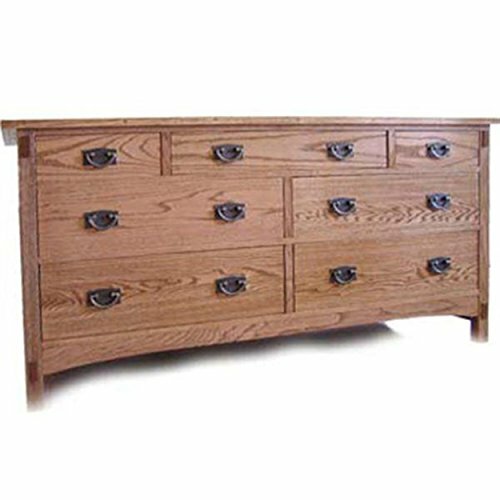 The seven drawer chest is a basic piece in any authentic Mission-style bedroom group, and with this plan you can make one of your very own. Through-tenon construction and long brackets at the corners are hallmark features of the Stickley tradition. The drawer slide designs are all wood, so there is no need for store-bought slide hardware. Build this super furniture that is sure to please and stand the test of time. Overall size (after built): 63 inches wide, 21 inches deep, and 32 inches high. If you have any questions about this product by Woodcraft, contact us by completing and submitting the form below. If you are looking for a specif part number, please include it with your message.